W.W. Seley was born October 6, 1853 in Wisconsin. His father, C.M. Seley, was the son of Scottish immigrants. After achieving some success where he grew up in New York, C.M. moved to Wisconsin an was a pioneer settler for the town of Eau Claire. 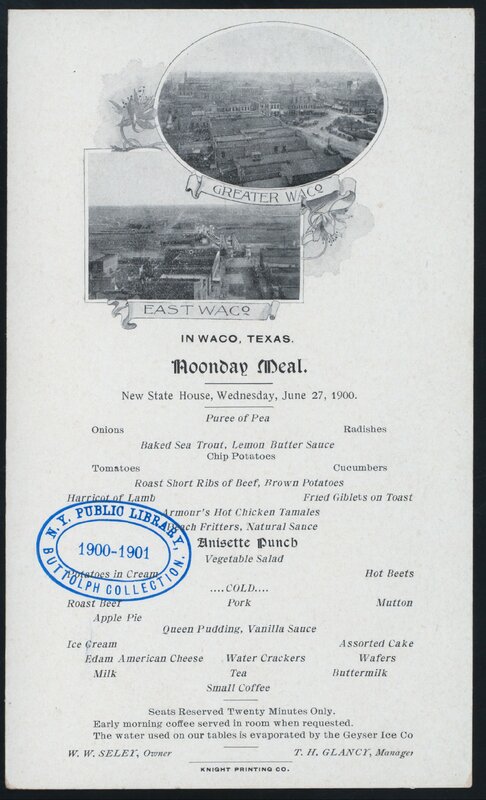 There, he truly became a leading citizen in business and civic life but in 1875, poor health required him to move so the Seleys came south to Waco. Brother William attended business school at Bryant and Stratton College in Chicago before returning to Waco to take over his father’s businesses. They owned 15,000 acres centered about halfway between Waco and Hillsboro and this allowed them to develop a lumber company that in turn supported a variety of other ventures. They also had a grain elevator in Waco that was the largest in the state. C.M. Seley died in 1891 with an estate worth the equivalent of $2.1 million in today’s money. Brother William determined not to let his father’s lifetime of business success based on integrity be forgotten. 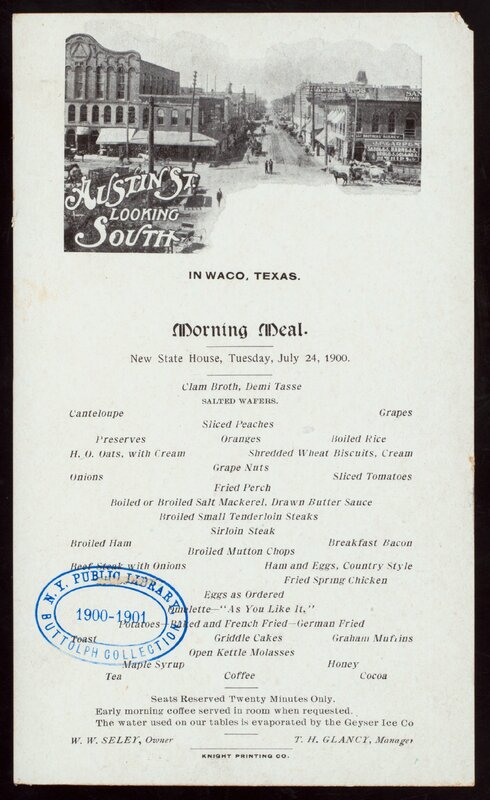 Marshall was looking through the menus and noticed that the tops included early Waco photos he had not previously seen before when a most significant discovery for our history was made! At the tops of two versions of the New State House menu are photos that show our old and famous Masonic Temple on the Square. This temple was built in 1875 by Sion Trice. Before now, the only photo known to show that building was a 1907 Gildersleeve image of the fire that destroyed it which hangs in our secretary’s office at Quebe Temple. It had long been a goal of Brother Marshall to find photos such as these and now, we have them. William Seley was always involved in developing various parts of the city. He led the Brazos Valley Initiative that made the river more easily navigable and the riverfront a more inviting place to spend an afternoon. He was in charge of a Texas Conservation Association and organized the Waco Volunteer Fire Department. Seley served as that department’s treasurer until it was became a city entity. Seley was the City Treasurer of Waco for twenty years during which the position required election. 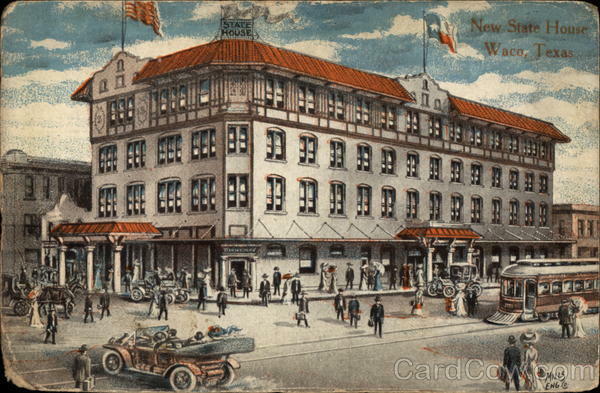 He was the first Exalted Ruler of Waco’s Elks Lodge 166, a leading member of the Jovian Order, and Chairman of the local Red Cross during World War I. Also during that war, Seley was appointed as field director of Camp Mcarthur which meant the government trusted him with the training of about 60,000 troops. He worked diligently in this capacity and when he died of pneumonia in 1918, it was said to have been caused by his relentless efforts for Camp Mcarthur. As a Mason, he was tried and true. He played a major role in bringing the Grand Lodge to Waco in 1902. Waco 92 collectively donated a modern day equivalent of $300,000 to establish the Grand Lodge’s new location at 6th and Franklin. He was a 32nd degree Mason, past potentate of Hella Shrine, and Knight Templar at Waco Commandery No. 10. He died on Christmas night, 1918. William Seley donated land on 18th street to the city of Waco for the purpose of naming a park after his father, C.M. Seley. Both men have had their memories attached to that park ever since and Waco is currently moving forward with renovation plans to improve the quality of the park which stretched from 18th to 19th street along Bosque Boulevard. The plans are expected to be finished by 2017 and they include better accessibility, enhanced greenery, and even outdoor exercise equipment.